SABIC, a global leader in the chemical industry, is launching here at Formnext 2017, in stand 3.1-G78, new LEXAN™ EXL AMHI240F filament. This unique product is based on SABIC’s LEXAN™ EXL polycarbonate (PC) copolymer technology, which delivers high impact performance and low-temperature ductility. 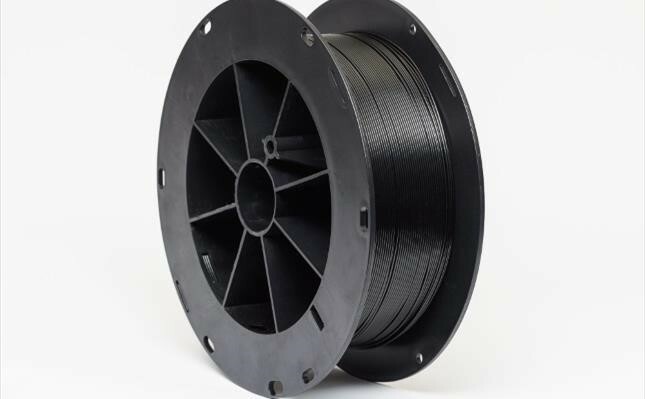 The new filament addresses the need for higher-performing materials in the industrial sector, and is designed for use in Stratasys® Fortus® Classic industrial printers. It is a potential material of choice for demanding aerospace, consumer electronics and automotive applications. LEXAN EXL AMHI240F filament is the first of several new materials with distinctive performance characteristics that the company plans to launch in the coming year. New LEXAN EXL AMHI240F filament features a high level of toughness, as well as improved ductility at room temperature and at temperatures down to -30 °C. Compared to standard PC, this material delivers up to four times better notched Izod impact at room temperature, and up to three times better at -30 °C, depending on print orientation. LEXAN EXL filament has a heat deflection temperature of 140 °C, which is higher than that of general-purpose acrylonitrile-butadiene-styrene (ABS) filaments. This makes the new SABIC filament a great candidate for use in applications that operate at elevated temperatures. LEXAN EXL AMHI240F filament complies with Underwriters Laboratories’ UL94 V-0 flammability standard at 3.0 mm in flat (XY) and on-edge (XZ) orientations, making it appropriate for a broad range of applications requiring fire resistance. It is available globally for sampling. It is initially offered in black, with plans to launch additional colors, including white, in the near future. The new product is the first LEXAN EXL-based filament commercially available for use in Stratasys® Fortus® Classic printers, as well as other printers with sufficient temperature capability and an open-format architecture. The material processes at standard Stratasys® print settings for PC. The LEXAN EXL AMHI240F filament supplements the portfolio of six filament products for Stratasys® Fortus® Classic printers that SABIC launched in May 2017. Concept parts printed with the new filament to demonstrate its high-performance features, including a compact drone design and a hockey face mask, are on display at SABIC’s booth. An additional exhibit at the company’s stand highlights the product’s improved ductility when subjected to destructive part testing. In 2018, SABIC plans to launch several more differentiated products based on its high-performance materials portfolio, including filaments based on ULTEM™ polyetherimide (PEI) and EXTEM™ thermoplastic polyimide (TPI) resins. The new filaments are designed for applications that require higher temperature performance. In addition to innovative materials, the company offers expertise and resources for design, application development and testing for additively manufactured parts. Importantly, SABIC’s filament solutions offer a single chain of custody from raw materials through filament supply. 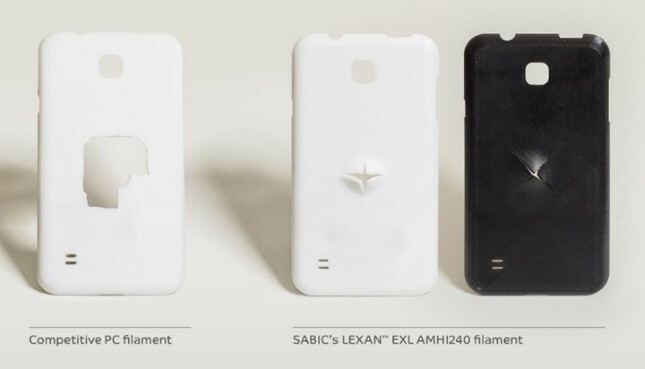 SABIC’s new LEXAN™ EXL AMHI240F filament features a high level of toughness, as well as improved ductility at room temperature and at temperatures down to -30 °C. Compared to competitive PC, this material delivers up to four times better notched Izod impact at room temperature, and up to three times better at -30 °C, depending on print orientation. The filament is initially offered in black, with plans to launch additional colors, including white, in the near future.